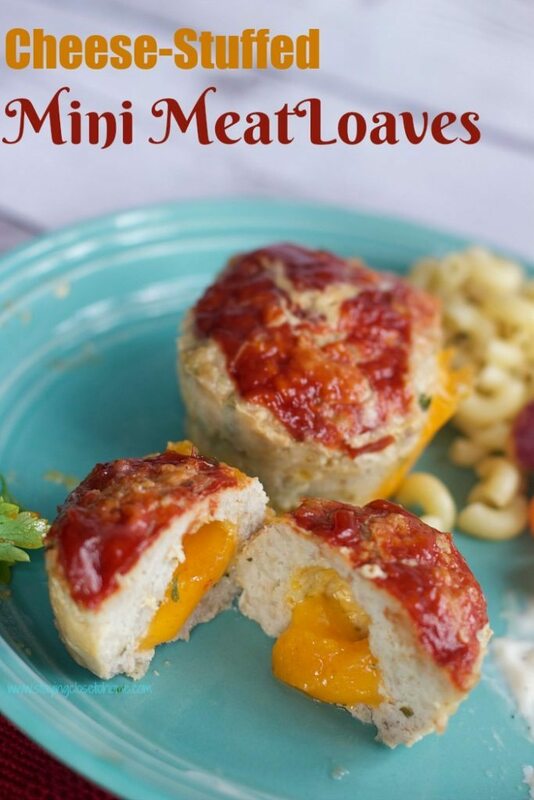 Cheese Stuffed Mini Meatloaves Recipe is a kid friendly meal that you can make ahead or even freeze for later use. Coming home from my Costco trip this week I found myself with 4 1/2 lbs of Organic Beef. Fortunately these are packaged in 1 1/3 lbs so I can just plop them in the freezer. My family is not a big red meat family but I crave it once in a while. This seems humorous to me as I was a vegetarian through out college and until I met my husband in my mid 20’s. 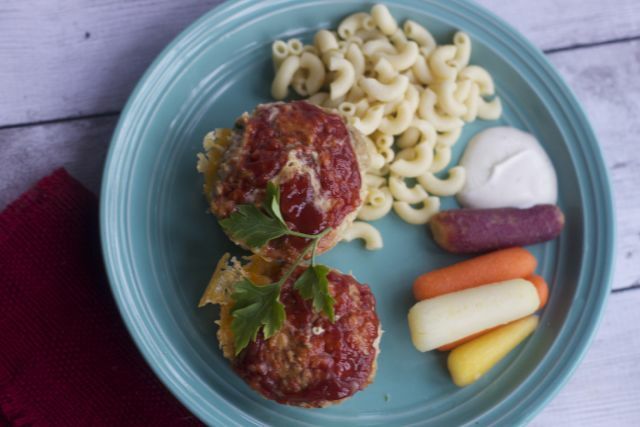 Although tacos is an easy route I found this recipe for Mini Cheese Stuffed Meatloaves in my coupon flyer that came from Kroger. They are kid friendly and remind me of big meatballs. What the heck I will give it a try. I found that using a large ice cream scoop kept my hands from having to roll up the raw meat and you could easily push in your cheese square. 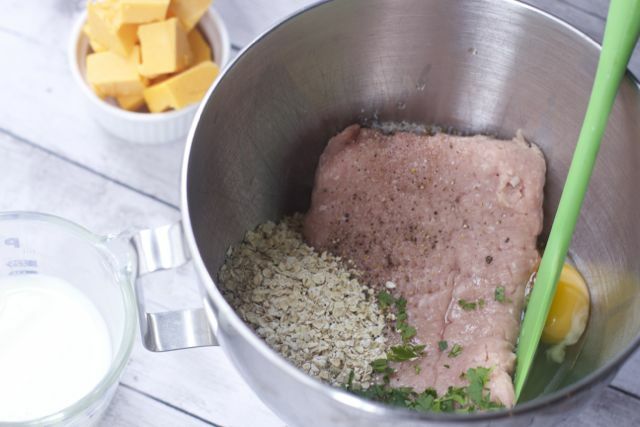 Place each mini meatloaf into a Nonstick 12-Cup Regular Muffin Pan and cook immediately or place in the fridge until you are ready to cook the Cheese Stuffed Mini Meatloaves Recipe. 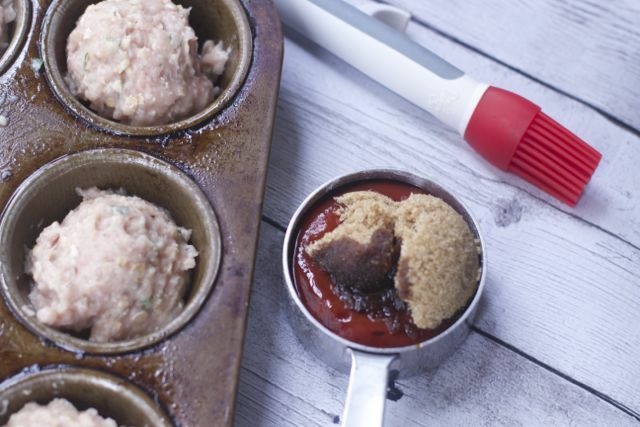 Make your ketchup topping and brush on top of each mini meatloaf with an acrylic pastry brush. Can’t live without one of these and no worries about bristles in your food. We cut my cheese off a huge chunk of cheddar so they were a little big and as a result they melted out of the loaves. But who doesn’t like a little extra cheese in their meat? 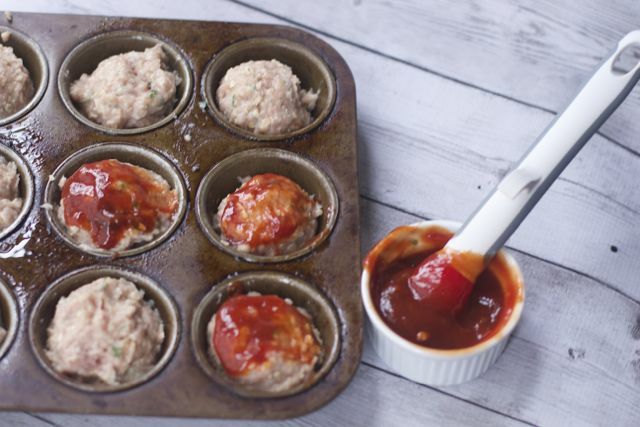 Use any of your favorite meatloaf recipes and make these kid sized treats that take only 30 minutes to bake. 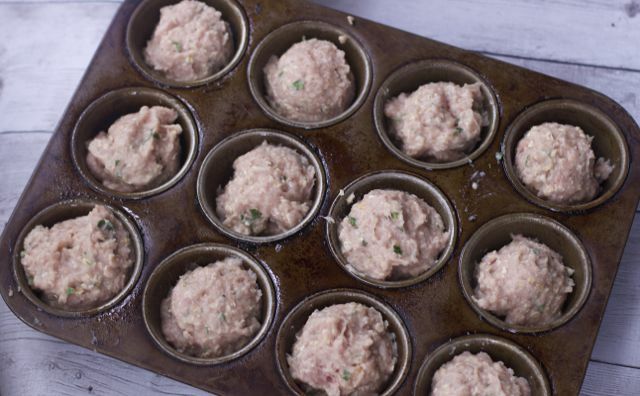 You might even want to try mini muffin tins for a kids buffet. Just decrease cooking time. 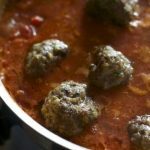 TO MAKE AHEAD: prepare the meat loaves without the sauce in the pan and cover with saran wrap the night before or morning of. Take the meatloaf filled pan out while preheating the oven and prepare sauce and proceed with the recipe. 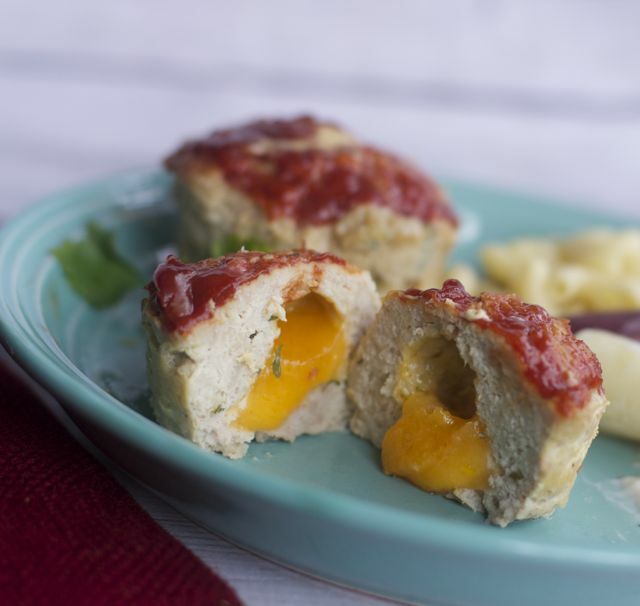 Cheese stuffed mini meat loves are the perfect kid friendly dinner . Combine the egg, milk, oats and salt in a large bowl. Add the meat and mix well. Will be a little runny so keep mixing to well distributed. 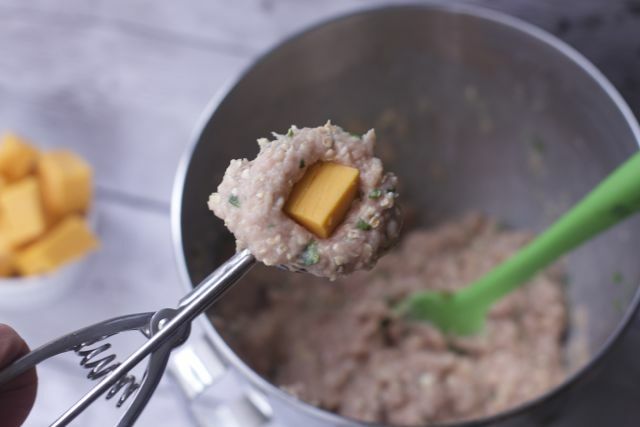 Insert one cheese cube into center of meat and either roll into ball around cheese in your hands or just scoop it into the muffin tin. Combine ketchup and brown sugar in a separate bowl. 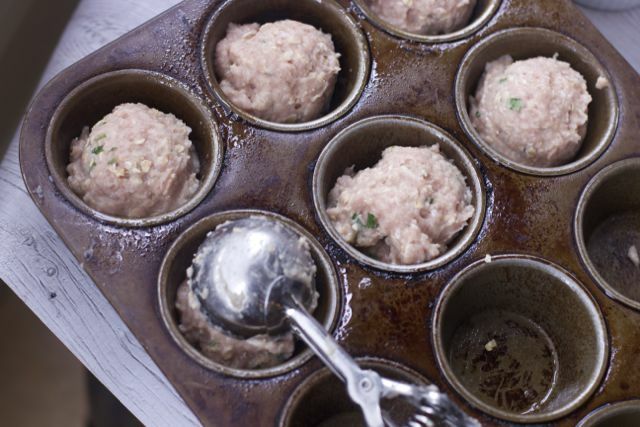 Stir thoroughly and spread over each mini meatloaf. If you love this recipe for Mini Cheese Stuffed Meatloaves and don’t want to miss any more wonderful Tips from Close to Home be sure and sign up to receive updates by email. Thanks for stopping by! I wonder if you used a higher fat meat than I did. Or if they were made a little bigger. It is always a good idea to cook with a sheet pan under things, but I did not have this problem. wondering what others think. I made this but the grease off the meat went over the edges of the pan and got all over my oven…. i had to stop cooking them after 10 mins and put them in a pan and get them done. I would put them on another tray so you dont have any issues like me or almost a fire…. What a great idea! I love this and will be trying it, I think I may make a bunch and freeze them. I love this idea! 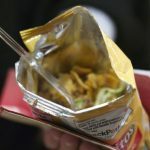 Ive never thought of cheese, BUT what about adding bacon too? Like a bacon cheese meat loaf. MMM. I love this idea though, Ill have to give it a try. T what a great idea. Just place them on a cookie rack and freeze them individually. Were you thinking b/f or after they were cooked? Those look sooo yummy. I think I will make them tonight for dinner.